One architect’s perspective on the use of shipping containers looking at three issues: compliance with codes, aesthetics, and property values. Compliance: Shipping containers, prefabricated homes, and panelized construction are growing in appeal and affordability. The resulting buildings are not the same as the “double-wide” trailers, as they have a permanent site and foundations. Anything that can handle the conditions at sea is certainly construction-worthy. When properly mounted, they meet all IBC requirements for hurricane strapping and can withstand wind loads up to 175 mph, and their end doors may be used as built-in hurricane shutters. The foundations may be designed to meet V-zone and coastal A zone requirements. When appropriately modified for residential uses, shipping containers also meet energy codes, ceiling heights, and the requirement for windows in bedrooms. Modified for commercial use with appropriate finishes and services, containers can serve as kitchens, restaurants, and small retail sites. Because of their steel construction, they meet all fire codes. They are intended to be permanent structures, and their steel frame and cladding may have a longer lifespan than many wood dwellings. Aesthetics: A quick scan of “shipping container houses” online reveals a wide array of styles and finishes, from the glossy bright colors used in seaside towns to the wood-clad units stacked and cantilevered in California’s priciest neighborhoods. There is no single style or finish that prevails; each is unique, just like any other single-family house. 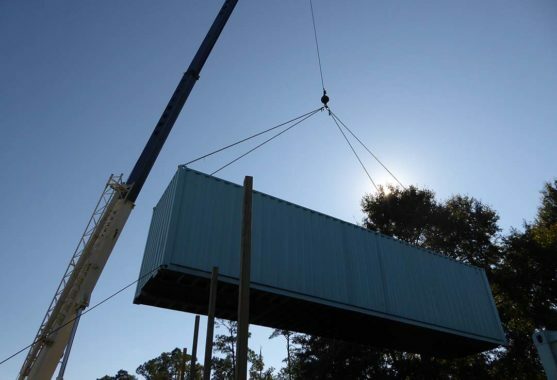 Most shipping containers are “high-end” with custom finishes and unique siting, and appeal to people concerned with sustainability – the reuse of a commercial product vividly demonstrates their recycling values. Rarely are shipping containers used in their “fresh off the boat” condition, but are painted, clad, and roofed for utility, beauty, and to fit into the context. Some architects feel that they have become the unlikely poster child of downtown revitalization, but as part of a balanced approach to materials and design, containers can signal a community that continues to reinvent itself. In an effort to retain young people and attract artisans, artists, and the creative class, cities need to continue to offer fresh options for living, and shipping containers are a popular and attractive solution. Property Values: To be honest, shipping containers are not a “cheap” way of building. There is a lot of modification necessary to make containers habitable and many non-traditional skills employed in this process: cranes, welding, etc. It is not as expedient as other forms of prefabrication, where finished modules are delivered to the site. Each house is therefore a labor of love, and requires the exacting care of any other building process. Because of their proportions, shipping containers are useful for infill sites, so that the city gains density and tax revenues and the neighbourhood gains value. Containers serve as a hallmark of trendy neighborhoods, where property values are on the rise, but there is no data on the effect that shipping containers have on nearby property values – a subject that is worth investigation.